BUFFALO, N.Y. -- University at Buffalo football head coach Lance Leipold has been named a semifinalist for the George Munger College Coach of the Year Award, which is presented yearly by the Maxwell Football Club. The list includes a field of 18 candidates for the award who have been selected by the MFC National Selection Committee. Leipold has led the Bulls to a 9-2 record this season. The nine wins are the most a Buffalo team has won in a season since joining the FBS ranks in 1999. It also ties the most wins in school history. UB also won nine games in 1986 as a Division III program. The Bulls will conclude the regular season at Bowling Green on Friday afternoon with a chance to clinch the Mid-American Conference East Division title and a spot in the MAC Championship game. 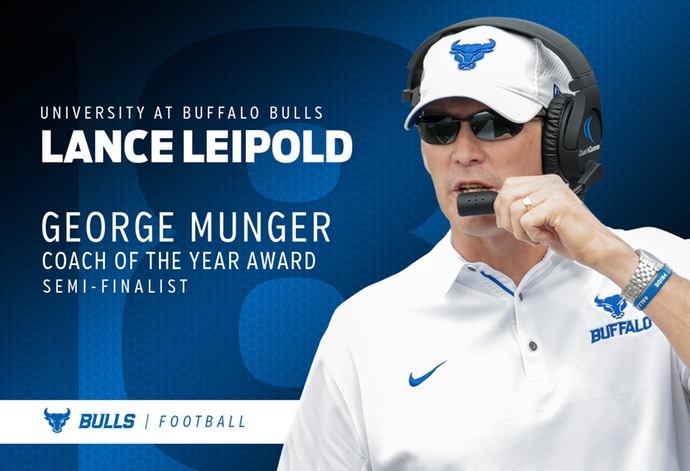 Leipold is the first UB football coach named a semifinalist for the award. Semifinalist voting for the Maxwell Football Club Collegiate Coach of the Year award will begin on Monday Nov. 26th and close on Monday, Dec. 10th. The finalist round will include the top three coaches as selected in the semifinalist round. Finalist voting will open Dec. 11th and run until Dec. 27th. The winner will be announced Dec. 28th.